No American soldiers offered greater courage or suffered worse conditions than those who fought in World War I. Our country suffered 320,000 casualties (116,500 killed) in little more than a year of combat. Those sacrifices are mostly unremembered now, tragically so. Stern lessons, dearly purchased, were learned in the trenches and recorded by great writers: Rupert Brooke’s poems, “Good-bye to All That by Robert Graves, Remarque’s “All’s Quiet on the Western Front”, Vera Brittain’s “A Testament of Youth” and Hemingway’s “A Farewell to Arms”. 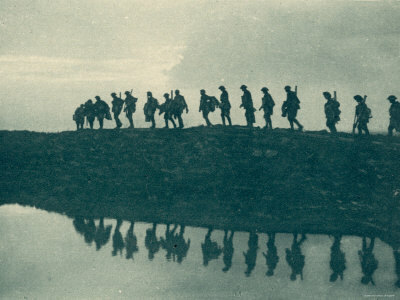 More recent writers have also shone light on the conflict’s darkest ditches: Mark Helprin’s “A Soldier of the Great War” and – especially for me – Paul Fussell’s “The Great War and Modern Memory”. I wish Americans would read these books. I wish Americans would learn from what others have sacrificed to teach. I wish Americans would learn to remember. The United Kingdom lost a generation of young men to The Great War. That loss is suffered still and several years ago many ceremonies and activities commemorated the hundredth anniversary of its beginning. Among them was a writing competition conducted by the Saveas Writers’ Group. A story of mine about World War I was awarded a prize and has at last been published in the competition anthology. The Bigger Picture: Reflections on the Great War is now available on Amazon. It’s worth your time. The effects of World War I loom large in daily events and cost American lives even now. Our public ignorance of this catastrophic war and how it acts upon our lives a hundred years after its end dismays and embarrasses me. I wrote this story in hopes of adding to general awareness of the War. I’ll post information here if and when my story is published. WELCOME! I've dedicated my life to literacy and literature for young people. I'm sixty-three and don't intend to change my focus now. I hope that this site will contribute to both! I hope it will be of use to kids, parents and teachers who love to read. For Kids: I want to know what you think of my story! Writing can be pretty lonely and authors like to hear from readers. Ask me questions about Chaos Gate and I'll do my best to answer them as quickly as I can. For Parents: I want to know what you think of my story! I'd also like to know how this website can best help you, what activities here are most effective and what you would like to see me include in the future. For Teachers: I know how hard you folks work. I'm offering you effective, interesting activities to accompany Chaos Gate, whether you're reading it aloud to your class, using it in small groups, or simply have one or two students reading it on their own. I have (or soon will!) comprehension questions, vocabulary activities and word find puzzles in pdf format for every chapter. Check them out and take what suits you best. Robert's story "Joaquin's Gold" just won the 2010 Art Affair Western Short Story Contest. The story brings legendary bandit Joaquin Murrieta back to Central California during the 1880's in a search for hidden treasure. Robert hopes to produce a book including all of his Joaquin Murrieta stories. Stay tuned. Author • Educator • Mountaineer · Adventures, explorations and surprises!